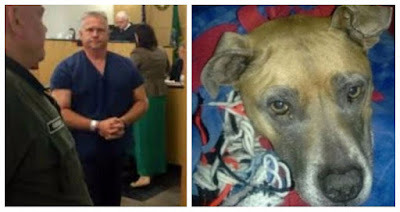 In an egregious case of animal cruelty, a Vancouver, Washington man has been sentenced to jail for dragging the family’s nine-year-old pit bull tethered by her hind legs behind his pickup truck. David Kadow, 52, was found guilty of second degree animal cruelty after the dog fell out of the truck and was dragged to her death. According to the Columbian, the jury deliberated for 40 minutes and reached the decision that Kadow either knowingly, recklessly or with criminal negligence inflicted unnecessary suffering or pain upon the dog named Hailey last May. The dog died after she got caught in the rear wheel well crushing her chest, as the leash she had been tethered to snapped. On May 22, Vancouver police responded to a report about a dog being dragged by a truck and then carried into a residence at the 3300 block of East 21st Street. Witnesses claimed Kadow’s wife became hysterical when she saw her dog dead and screamed to her husband that he had killed her. Deputies found Hailey’s body in the house. On the right side of the truck, deputies could see the dog’s claw marks as she desperately tried to climb on board the truck while being dragged. Kadow had been driving with a suspended license for a recent DUI and had just been released two days prior to Hailey’s death from jail while on a supervised release program. Kadow was sentenced to jail for 90 days on the animal cruelty conviction, 10 days for driving with a suspended license to run consecutively and 60 more days on a separate matter. The judge suspended 354 days of the potential sentences for two years and will be served under probation. Rest in peace Hailey. We are so sorry you were failed and made to suffer an agonizing death. We hope you received a little justice. 0 Response to "Heartless Man Sentenced To Jail For Dragging Dog On Hind Legs Tied To Truck"